When it comes to the Guinness Pro14, you have to go all the way back to round one at the very end of August to find the last time Cardiff Blues lost on the hallowed artificial turf of the Cardiff Arms Park. In fact, that was the only league defeat suffered on our home ground in the whole of 2018, with just European and Anglo-Welsh losses to overcome, as the Arms Park re-established itself as a fortress. A lot of that came down to the defence, but there have been times early this season, in the transition from a Shaun Edwards consulted defence to a full-time Richard Hodges defence under the overall control of John Mulvihill, that we have stuttered when without the ball. Defensively we were too often found lacking as we let leads slip away early in the campaign at the likes of Zebre and Benetton, started slowly in the Heineken Champions Cup against Glasgow, and then struggled big time on the road at Cheetahs and Glasgow in the league. However, that last game where the Scottish side put 28 points on us and secured a try bonus point inside the first 40 minutes was a turning point, and since then we have been defensively improving week-on-week. 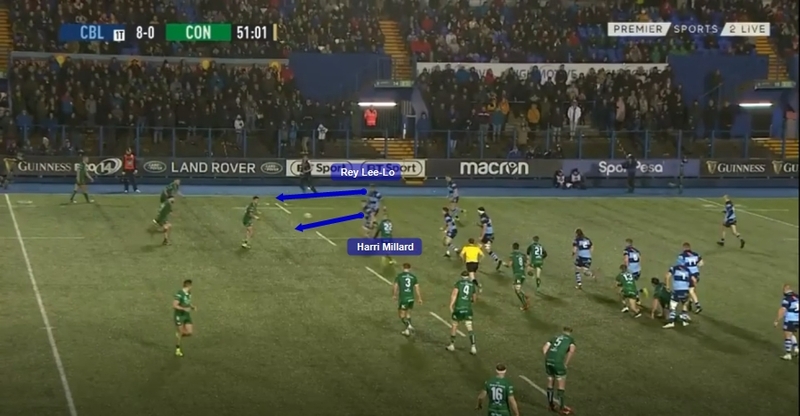 That culminated on Saturday where a huge defensive effort saw Cardiff Blues make 133 tackles with a 92% tackle success rate, force 20 turnovers and restrict Connacht to just 210 metres at less than two metres per game with only the single line break. This sort of form is based around a hard working, organised and committed loose five forwards, with the starting five making 62 of the team’s tackles between them. Physical solo tackles like these are enough to deter a team like Connacht from going to one-up runners, especially useful on a wet and windy night playing on a plastic surface they are just not used to. However, the prowess of the Cardiff Blues loose five forwards in posting high numbers of tackles, and crucially making effective tackles, is not something particularly new. Even when we were struggling for results experienced guys like Josh Turnbull and Olly Robinson were putting in the work. What really came to the fore as a point of difference on Saturday was the defensive leaders in the backs stepping up, reading the game well and making smart decisions to put pressure on Connacht. Of course both Lloyd Williams and Steve Shingler have main responsibilities as the half-backs in guiding and driving our attack around the field, especially on an evening like that in Cardiff. As experienced members of the squad they play big roles in the defensive side of the game as well though, especially with Shingler having the ability to play inside centre and Lloyd having arguably the best rugby brain at the club. 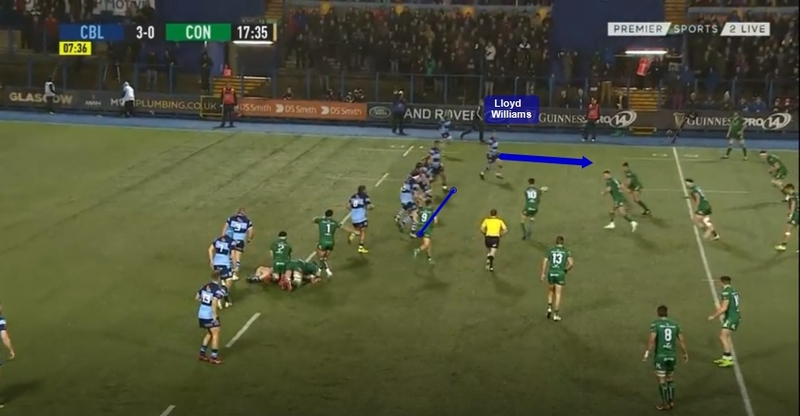 What is evidenced here is their timing on the outside spot blitz that turns Connacht back inside to those aforementioned forwards ready to not only make the tackle, but get over the ball and slow the opposition attack right down. Looking at Shingler’s clip, it is hugely encouraging to see the forwards working hard to cover that inside shoulder where we have been weak on occasions early in the season. The main defensive weapon the backs had on Saturday was the partnership between Rey Lee-Lo and Harri Millard though. Now both evidenced some excellent individual defensive prowess, and we already know that on his day Rey Lee-Lo can make a huge impact without the ball thanks to his speed, reading of the game and physicality. It’s been Harri Millard who has made a real impact though, stepping up at outside centre over the last few weeks to not only be a threat with ball-in-hand, but to show a maturity in how he defends from the 13 channel. 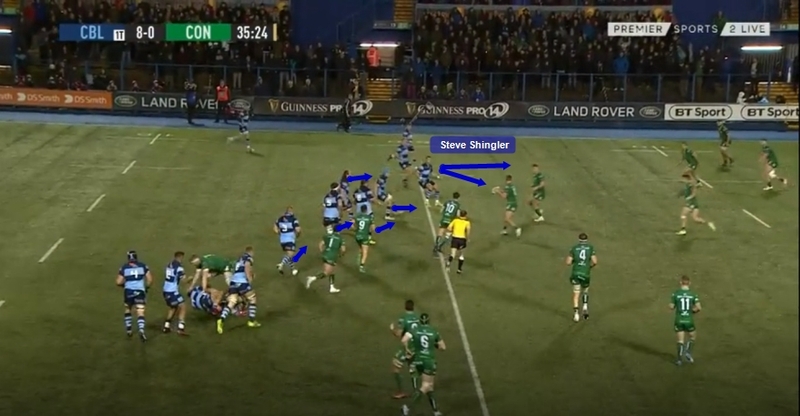 Working together they prevented Connacht having any joy in the wider channels, conspiring to overcome situations where they found themselves on the wrong side of a three-on-two in midfield, and creating pressure with their joint line speed. It was their natural ability to separate slightly as a spot blitzer goes up in the first instance before rejoining as a defensive duo to prevent any weak shoulders forming for a missed solo tackle or an offload opportunity. 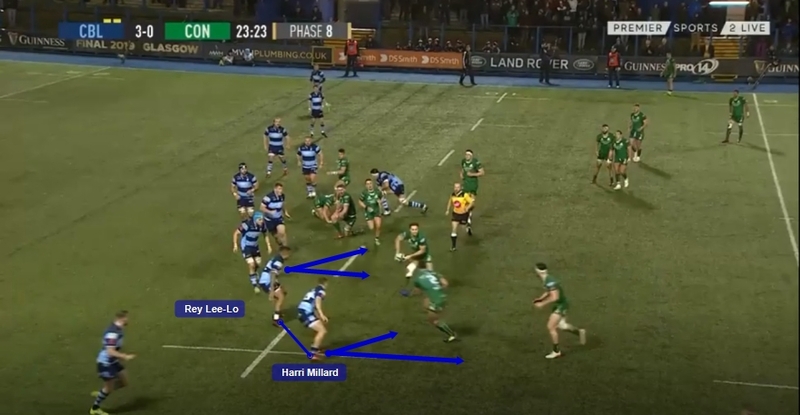 Indeed the pressure they then created did lead to turnovers as in the second clip, or when Connacht were forced back inside the forwards were once again on hand to get over the ball and at least slow the attack right down. John Mulvihill spoke in the build up to last weekend’s game about how we’ve formed a defensive identity over this recent block of fixtures, and a defensively strong centre partnership is right at the heart of that to compliment the work of the loose five forwards. The good news is that with Willis Halaholo looking sharp in defence away at Glasgow in the Heineken Cup, and Garyn Smith also strong without the ball as shown with a smart rip against Connacht off the bench, there are plenty of options to turn to. With the attacking game just getting into gear, and a run of hugely important games coming up during the Six Nations period, if this defensive form can continue through to the end of the season then we can give ourselves a great shot at the Pro14’s Conference A play-offs and qualification for the top table of European rugby.